Sheriff Thomas J. Dougherty reports the arrest of a Franklinville, NY resident after a reported theft from a local business. On April 7th, 2019 Salvator F. Faliero, age 55, was charged with Grand Larceny in the 4th Degree (class E felony) after the investigation into a theft from the Tractor Supply in Geneseo. Police stopped and held Faliero who was found to still be in possession of the stolen property and then turned the investigation over to Deputy Sheriffs. Deputy Sheriff Marty Herkimer of the Patrol Division and Deputy Sheriff Dave Richardson of the Forensic Identification Unit (FIU) investigated the theft, with Deputy Sheriff Wayne Swede of the Patrol Division making the arrest. Faliero was turned over to Central Booking Deputies at the Livingston County Jail for processing and pre-arraignment detention. The District Attorney’s Office was contacted regarding bail to the felony charge and advised that due to Faliero’s past felony convictions per the Criminal Procedure Law the local justice could not set bail and must hold Faliero for further proceedings. 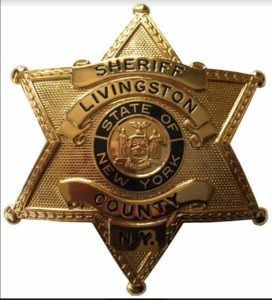 Faliero was later arraigned in the Livingston County Central Arraignment Part (LC-CAP) at the Livingston County Jail by Town of Geneseo Justice Kathleen Houston. The Judge followed the CPL and remanded Faliero to the custody of the Sheriff without a possibility of bail.